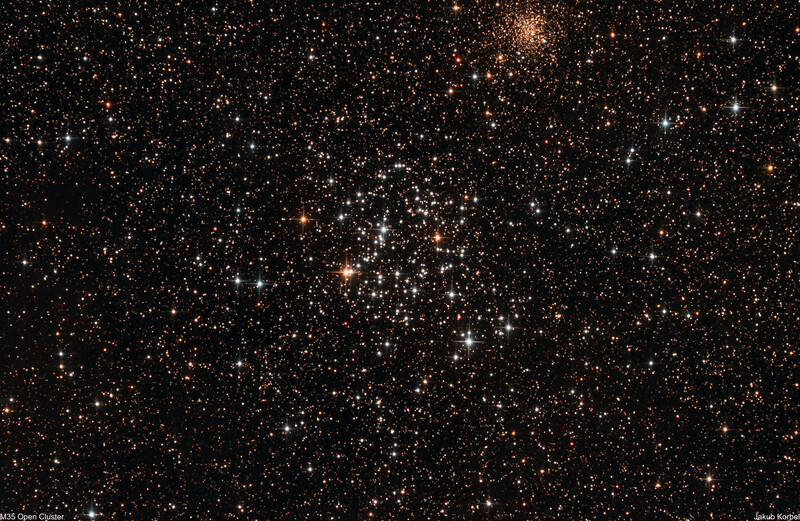 Messier 35 an open cluster located in constellation Gemini. The cluster is approximately 2800 light-year far from Earth and it contains roughly 200 stars. Second open cluster NGC 2158 is located in the background (upper right part of the picture). I didn’t know that there is another cluster in field of view. If I would know it, I would change the composition of the picture. This cluster was the last one out of four captured during single night. In the early morning I slewed to M35 and went to sleep. The camera captured 56 exposures, 3 minutes each, before the dawn arrived. This means nearly 3 hours of total exposure time.